Dark Politricks: Was Ken Livingstone MAD for defending Labour MP Naz Shah? Was Ken Livingstone MAD for defending Labour MP Naz Shah? The Uganda plan where it was actually debated about giving a portion of British East Africa to the Jewish people as a homeland. In 1938, the USSR wanted to introduce a policy of areas within its state reflecting the culture of the people and they were going ahead with the formation of the Khabarovsk Territory or (JAR - Jewish Autonomous Region), for the Jewish people within this policy. During the 1930's in Imperial Japan, there was a proposal to settle Jewish refugees escaping Nazi-occupied Europe in Japanese territories. The Madagascar plan was a suggested policy of the Third Reich government of Nazi Germany, and previously discussed by the UK, France and Polish, to forcibly relocate the Jewish population of Europe to the island of Madagascar. In March 1940, the issue of an alternative Jewish Homeland was raised and British Guiana (now Guyana) was discussed in this context. But the British Government decided that "the problem is at present too problematical to admit of the adoption of a definite policy and must be left for the decision of some future Government in years to come." This is just one among many other plans for a Jewish homeland that have been previously discussed. 2. In July of 2014, she also wrote about a newspaper poll on alleged Israeli war crimes in the Gaza conflict, saying “the Jews are rallying to the poll”. She has also landed herself in hot water for comparing Israeli policies to those of Adolph Hitler on Facebook last September. This is not exactly something only a few people have said. The treatment of the trapped people in their open prison of Gaza is just like the Jewish Ghetto's of old in which regular incursions would take place and people murdered. The two recent wars in Gaza killed more women, kids and animals than they did Hamas fighters. It was admitted the IDF have a policy of killing innocents to try to turn them against their leaders. These are war crimes yet whenever a security resolution comes up in the UN it is vetoed by the USA however ethical it would be to punish Israel. They are like a tortured child who then goes on to torture other children. Let's not forget the whole concept of the UN and International Law came about after WWII, the Nuremberg trials in which the UK, USA, France and USSR sat as judges and tried their victors justice against the Germans. No trials were carried out for the Dresden or Tokyo fire-bombings or the nuclear bombings of Japan by the USA which killed millions. However this new International law was supposed to be followed by all nations yet despite this, Israel has flagrantly broken it many time. The highest crime was starting wars of aggression on another country. How many times has Israel done this, how many times have the US with UK and French backing done this in recent years? International Law only applies to those we attack and defeat it seems. Naz apologised for he comments in the House of Commons but was suspended for her actions. Later though, ex London Mayor and Labour member, Ken Livingstone went onto TV to defend her giving a historical analysis which covers some of the points I have already mentioned but also talked about Hitler and how he had made a deal with the Zionists to get rid of the Jews to Palestine. If you don't know your history and believe it or not Ken DOES, then you should read up a bit more. The agreement was designed to help facilitate the emigration of German Jews to Palestine. While it helped Jews emigrate, it forced them to temporarily give up possessions to Germany before departing. Those possessions could later be re-obtained by transferring them to Palestine as German export goods. The agreement was controversial at the time, and was criticised by many Jewish leaders both within the Zionist movement (such as the Revisionist Zionist leader Vladimir Jabotinsky) and outside it. For German Jews, the Agreement offered a way to leave an increasingly hostile environment in Nazi Germany; for the Yishuv, the new Jewish community in Palestine, it offered access to both immigrants and some economic support; and for the Nazis it was seen as a way of breaking the Anti-Nazi boycott of 1933, which had mass support among European Jews and was thought by the German state as a potential threat to a fragile German economy. Here are some paper titles from the time of the Jewish anti Nazi boycott. So when the Israelis attack the Boycott, Divestment and Sanctions (BDS) attacks on them they should remember that they did the same thing to Germany in the 30's. This led to Hitler wanting to get rid of the Jews, preferably through immigration though many European countries and America refused to have them in big numbers. Therefore despite their being no "smoking gun" evidence of Hitler giving a command for the "final solution" many historians believe it was because he wanted the Jews out of Europe and not killed and that it was Himmler the head of the NAZI SS who took it on himself to run the extermination camps on the eastern borders where Jews were basically robbed and then killed. Even David Irving the revisionist English historian who was jailed for his "anti-semitic" beliefs under draconian European laws which prevent any discussion of the holocaust. Now believes that although Auschwitz was plainly not an extermination camp as it was destroyed after the war and what you see now is the rebuilt version Stalin put up. He does admit that on the Eastern border a process of robbing and pillaging of Jewish goods was going on with the people exterminated at the end. Most likely in ditches by machine gun. Auschwitz may have killed some Jews, but the photos you see of piles of emaciated bodies are those who died at the end of the war in the typhoid breakouts. Auschwitz have constantly altered the number of people who died at the camp downwards until it lies around a million. However despite this downwards trend the 6 million number of Jews killed remains. How and why I don't know. Even the Israeli's tried to create a log of all 6 million Jews killed in the war and couldn't manage to get anywhere near that figure. It seems the 6 million number is sacred and it even appeared in pre-WWII papers such as this claim from 1921. 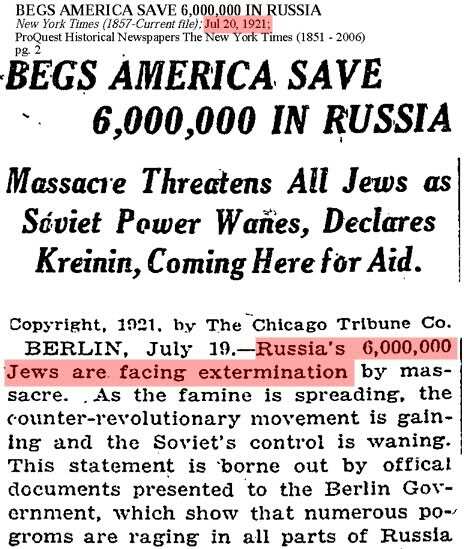 You can do a Google search and view the images of all the other mentions of the other papers mentioning this figure and the 6 million deaths that were coming to various Jewish communities. We must also remember the word Holocaust means a "Burnt Offering". These are quite strange words to use for such a slaughter of such scale. Who was being burnt - Jews, so what was the offering for? Maybe it was for the land of Israel. As the famous Zionist Yitzhak Gruenbaum said during the war. Not exactly helpful to the Jews suffering in Europe at the time. However when Ken Livingstone is getting called "Mad", a "loon" and a "liar", we must remember that there was some measure of collusion between the Nazi's and Jews in the German 1930's to get them out the country and to migrate to Palestine. This cannot be refuted by anyone with a semblance of knowledge of history I'm afraid. So just remember, that just because you don't like to believe something it doesn't make it untrue. One thing you should also know is that Israel is the ONLY country to have threatened the rest of the world with nuclear annihilation under their Samson Operation, named after the tale of Samson who pushed the temple down onto himself and all his enemies. It is basically a "well if we are going down, so is the rest of the world" policy which you can read about in full here. Ron Rosenbaum writes in his 2012 book How the End Begins: The Road to a Nuclear World War III that, in his opinion, in the "aftermath of a second Holocaust", Israel could "bring down the pillars of the world (attack Moscow and European capitals for instance)" as well as the "holy places of Islam." He writes that "abandonment of proportionality is the essence" of the Samson Option[dubious – discuss]. We possess several hundred atomic warheads and rockets and can launch them at targets in all directions, perhaps even at Rome. Most European capitals are targets for our air force. Let me quote General Moshe Dayan: 'Israel must be like a mad dog, too dangerous to bother.' I consider it all hopeless at this point. We shall have to try to prevent things from coming to that, if at all possible. Our armed forces, however, are not the thirtieth strongest in the world, but rather the second or third. We have the capability to take the world down with us. And I can assure you that that will happen before Israel goes under. Not exactly a nice option to know about for all the Zionist supporters of Israel. How would you feel if your family and your grand-kids families were OR could be wiped out due to our supposed ally and friend, Israel, and their own nuclear bombs?